This September will mark my seven-year anniversary with DemandGen. As Director of Services Operations, I lead the project management team and work with our COO Greg Carver to manage overall operations. 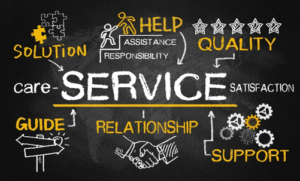 I’ve developed and help refine processes over time based on the level of service we strive to provide and how it’s worked for us successfully in the past. We all know that it is far better to keep your clients happy – happy clients lead to loyal clients, which hopefully leads to referrals for the great work you’re doing. We take our clients through each phase of our engagement model: discovery, recommendations, design, technical build, measurement, and optimization. We have our time-tested project plans and processes in place to ensure that we’re dotting our i’s and crossing our t’s as we coordinate cross-departmentally to ensure we align the appropriate resources and skillsets with each project. We’ve managed straightforward projects for a single office and coordinated grand efforts with multiple vendors across multiple regional rollouts, where each region often has its own specific needs and goals. 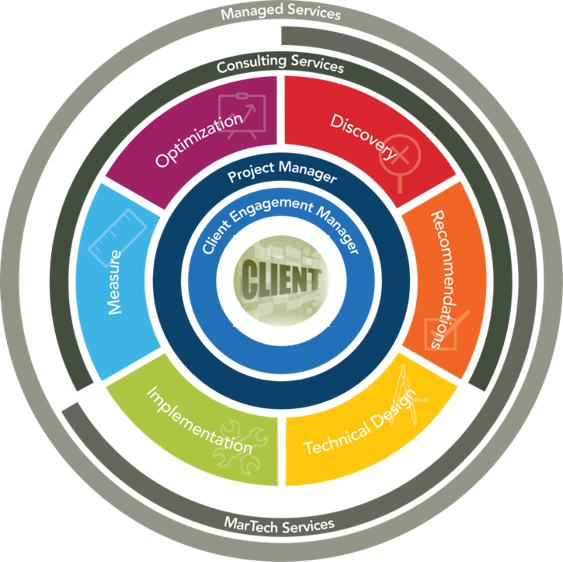 Throughout each phase and everything we do, our engagement model makes our clients the central focus. While our reliable processes lead the way, in the end it all comes down to how we make our clients feel. Here are the four things we keep in mind with our goal of exceeding our clients’ expectations and providing an outstanding experience that they want to tell their friends, coworkers, and boss about. We all get a ton of email every day and weeding through it can sometimes feel endless. It’s important to let your client know that you received their message and that you are on it – even if just to say you’re looking into it and will get back to them. Soon after we sign on with a new client, one of our client engagement managers will reach out to introduce themselves. Whether it’s a phone call or a quick email to schedule an introductory call, it’s important to immediately touch base to ensure a clean sales-to-service process and setup a cadence of communications moving forward. To your clients, you and your organization are all part of the same team. It doesn’t necessarily matter if you’re on different floors of your office building or even in different time zones. Once everything is in motion, it’s important to maintain a high level of responsiveness and not leave them wondering if their message was even received. I’m sure you’ve been here, too. Sometimes, there’s a difference between what someone wants versus what they actually need. It’s important to understand where clients are in their journey so you can help them get to where they want to go. Not everyone is ready to jump into the deep end of the pool. It takes time, so helping your clients understand how to meet their goals and outlining the steps to get there will put you in a better position for successful outcomes. You have to dig deep to really identify their needs, what their pain points are, and what they’re being measured against. Review their business plan, learn who their competitors are, and research what’s happening in their industry, all of which can ultimately affect how you work with them. This level of detail helps to build trust by showing you understand what they’re going through and that you’ve got them, ultimately enabling you to deliver a high-quality product or service that helps to move their business forward. Our goal is to gain our clients’ confidence and trust and be viewed as a partner. Vendors simply sell products; partners support each other in the pursuit of common goals. Be as accommodating as possible, but being honest and proactive is always the best approach. For example, when a client wanted to tackle their data structures in a way that would have ultimately hurt their contact segmentation, we (tactfully) advised against it. We carefully reviewed the data and outlined the best practices for taking a different approach. This created a broader discussion that tied back to their overarching objectives, which enabled us to help our client meet them in the best way possible. Earn their trust by letting them know they’re in good hands with someone who has their best interests in mind. Remember: you’re the expert and that’s why your clients come to you for help. Also, and this almost goes without saying, make sure you’re doing quality work for your clients. Don’t try to cut corners and skip QA. Always get another set of eyes on your work before handing anything over. Most of our clients are extremely busy and trust the work to be 100% accurate and ready to be shared with others in their organization. Everyone wants to look good in front of their boss (myself included!). Really listen to your client to identify what they struggle with on a daily basis and determine how you can help them be an agent of change within their organization. Then, help them present the value of the work they’re doing. We suggest providing brief documentation or a presentation that lays out the details of the project(s) and showcases before-and-after metrics to demonstrate the ROI. This keeps things simple and offers your clients a value-add to help them demonstrate the amazing work that you completed together. You can do the best work in the world, but if you don’t share the results with others no one will ever know about it. Make it super easy for your client to be a hero and get the recognition they deserve. 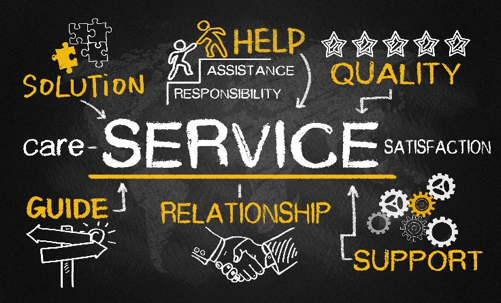 We’ve worked with a variety of industries as well as small, large, and global companies over the years, but our goal is always the same: exceed expectations and provide outstanding service that makes our clients look and feel great. Regardless of industry, clients stay with — or leave — service organizations based on how you make them feel. Even if you’re delivering a quality project, people will leave if you don’t provide a good client experience. And you’re only as good as your last impression. At DemandGen, we’re constantly looking for ways to exceed our clients’ expectations. It’s something that’s really ingrained in our culture, and that David Lewis, our CEO, talks about on a regular basis. Learn more about the services we offer and let us know how we can start exceeding your expectations! Christina Yozallinas, Director of Services Operations, helps ensure our team’s operational effectiveness and utilization by establishing operating procedures, streamlining processes, monitoring performance dashboards, and managing our internal systems used for collaboration and learning. She defines and implements our onboarding procedures for new team members and helps ensure smooth facilitation of resource management by aligning client needs with internal resources. Processes are vital to customer satisfaction. I like what you said about just touching base to let them know you get their message and are working on the situation. Communication works wonders.